Colomba means dove in Italian and it’s a traditional Easter cake. 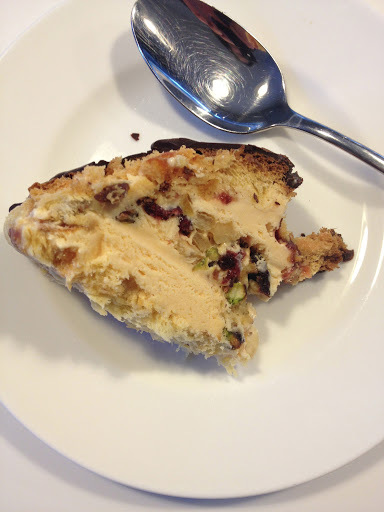 It’s much like panettone – traditional Italian Christmas cake – except it doesn’t have sultanas. Both colomba and panettone use a biga – or sponge starter. I’ve never attempted panettone because it’s not meant to be easy. Not difficult per se, but the recipe is long and there are various stages during which you really need to concentrate. Plus you need to hang panettone upside down when it’s done (until it ‘sets’). I was almost tempted last year when I found out that Patrick at Bakery Bits had started selling the waxed paper cases you need for panettone but then my mamma’s friend bought an exceptional one back from Italy so I never bothered to make my own. 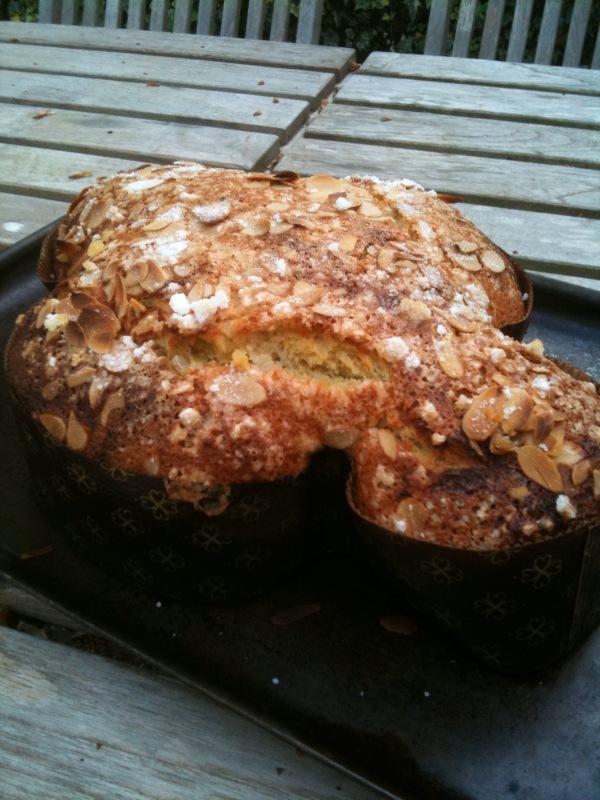 Then Patrick posted a recipe for colomba and started selling Aroma Veneziana which is rich with citrus and almond oils with a hint of vanilla. He also sells the colomba cases (I found the 750g ample big enough for the recipe below. You can make the cake in a traditional cake tin but the dove shape is traditional). So I decided to try it. I made a few changes to Patrick’s recipe which I’ve detailed below. I actually made two colomba cakes – retardeding the proof time on my first attempt because I ran out of time (I put it in the fridge at the stage marked * below, because from start to finish this cake takes quite a long time, you really need to start it in the morning) and cooked it for 40 mins. Refrigerating it didn’t seem to affect it at all, if anything I think it was tastier. 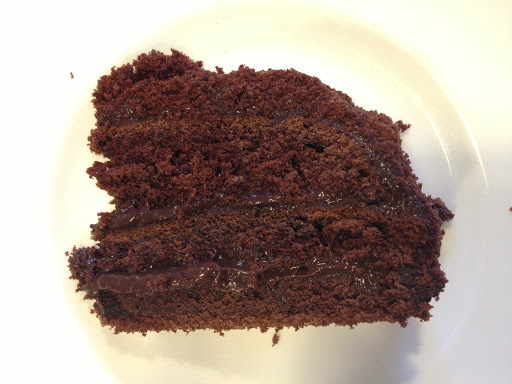 It was supremely moist – a tiny bit underdone and doughy at the very centre, but unnoticeable to all but me. 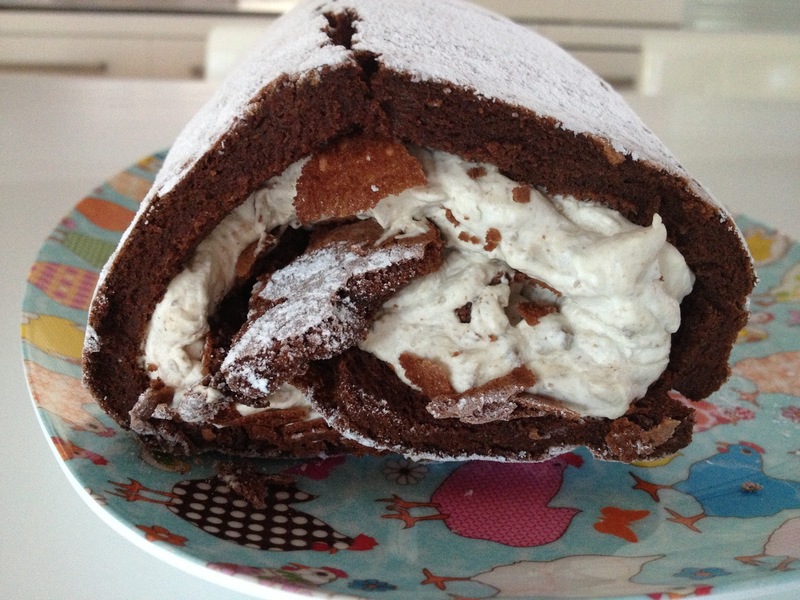 I cooked the second one for longer – probably 50 mins and it was more authentic ‘colomba’ but slightly dryer. My oven is ferocious so I cooked at more like 180/190C. Patrick’s tip of putting silver foil on top is one to be followed, as the egg white/sugar coating burns easily. In fact I covered the whole of the colomba for the middle portion of the cooking time. Anyway, this is what you need to do. Mix together the sugar and water with the egg yolks; separately, mix together the yeast and flour and add this to the egg/sugar/water mixture. You get a thick batter. cover with cling film and leave for a good 30-40mins until it’s really bubbly and frothy (note: my kitchen is about 20 degrees, if yours is warmer/cooler you’ll nee to adjust the time accordingly). The frothing, elastic sponge, as above. Whisk the water into the sponge, then mix in the butter. Separately mix the flour and yeast together and add these to the sponge. You should have a thick, stick, moist batter. Cover with cling film and leave for about two hours, until doubled in volume. The first dough, as above. 2 teaspoons of Aroma Veneziana (this is my favourite big, I adore the smell and it gives you a hint of the good things to come). Take your first dough and now mix in the sugar, honey and egg yolks. It’ll look a bit unpromising and ‘separate’ – don’t panic. Add the Aroma Veneziana, the orange zest and butter, then the flour and salt. Now, Patrick didn’t add the mixed peel til later (see his original recipe, link above), but I added mine here too. Mix all together. Now here, Patrick says to knead until you have a soft, smooth, elastic dough. My dough was sticky and a bit unmanageable so I rested it for ten minutes, then gave it a light knead, rested it for ten minutes, then gave it a light knead, rested it for ten minutes, then gave it a light knead. I did this on a lightly oiled chopping board. Then I picked up the original recipe which says to put it in a oiled bowl and cover with cling film * and leave to rise ‘dramatically’, Patrick says until it’s about three times the original volume which takes about 3-4 hours. When that’s done, Patrick cuts his dough in half and puts it in the case (after rolling it), one half making the ‘wings’ and one half the head to tail bit (so they overlap). I didn’t do this, I cut three pieces to fit head to tail, and two for the wings, rolled it out to flatten it put it in the case and pinched the dough together. I found the case was quite floppy once the dough was in it, so I sat it on a baking tray and when the time came put the whole lot in the oven. At this stage you let it sit and rise again for about 2-3 hours, until doubled in volume, covered with a damp tea towel. Mine easily took more like three hours. Just before baking you make a paste of the topping ingredients: 2 egg whites, 25g caster sugar, 25g ground almonds and put the whole lot on top of the colomba, spread out with a pastry brush/back of spoon to make sure every bit is covered. Please don’t miss this bit – it’s the topping which really makes it. Scatter broken up sugar cubes and flaked almonds on top – I used three sugar cubes and that was plenty. Cook for 40 mins at 200C and check if it’s done by putting a skewer in. If it’s burning put silver foil on top. Even if it looks really done – do check with the skewer, if it comes out really gunky it’s not done yet. I can’t even begin to tell you how great this is. Patrick says it keeps for four days in a tin, but I made my two a week ago and although one is gone, the other is still superb. But if you do have any left you can always toast it/butter it. We eat it in the morning dipped in caffe latte. This recipe seems long – it is. But take your time and try it. It’s pretty fool proof considering the result! Let me know how you get on…and don’t save it just for Easter! This entry was posted in Bread, Buns, Cakes, Celebration, Presents, Teatime and tagged Colomba, panettone, Pasqua on April 27, 2011 by Annalisa Barbieri. "There are buns for tea"
A bun. This one from the first batch, thus without its top hat of crushed sugar cubes and amaretti biscuits, which I now regard as obligatory. As regular readers will know, I don’t really like cooking with yeast. I trust it to the breadmachine – see bagels – but making dough from scratch, I don’t really like using yeast. Which is why I’m so comfortable, and confident, with sourdough. But recently a recipe for Panettone teacakes on the Bakery Bits blog caught my eye, or rather, the Tweet advertising them did. So I tried them. 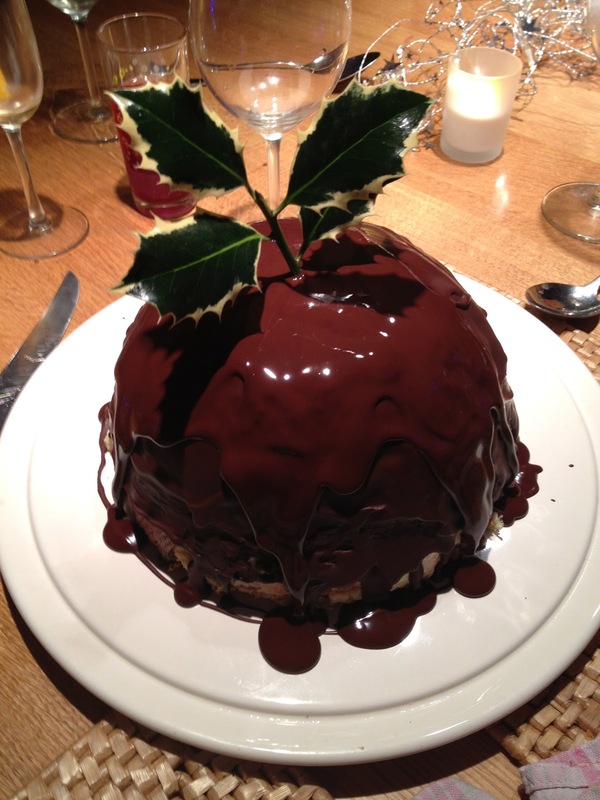 The first time, I didn’t read the recipe properly and only realised you needed white chocolate when it was too late. I had dark chocolate (I always have dark chocolate) which I thought I could substitute because I thought the recipe might use the chocolate as ‘chips’. But it doesn’t – it’s used as as lard substitute. 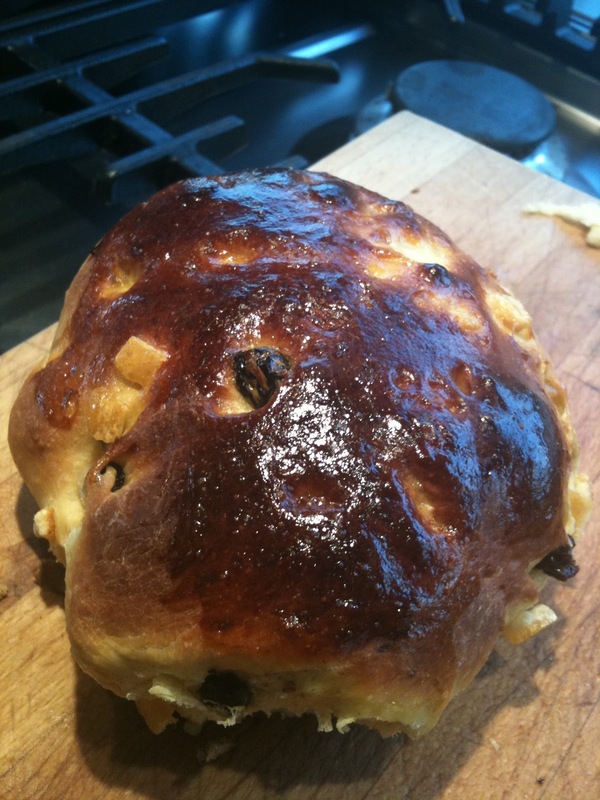 See Dan Lepard’s original recipe here from 2007, which explains it all rather beautifully (one of the many reasons that I love Dan’s recipes is that he tells you a bit about the whole chemistry of it too, so I always learn something, beyond how to make a new bun or bread). Anyway I left the white chocolate out in my first batch, and also didn’t have enough candied peel. And used mostly sultanas rather than raisins. And didn’t have the recommended topping. But they were still great if a little less sweet than I think they should be. The second time I made them I had all the relevant ingredients and they were strangely, slightly less soft but completely delicious. These are the new house teacakes. But the dough makes quite a lot (about 14) and that’s too much for us. If you want, this dough freezes beautifully. A few days after first making these, when teacakes were called for (freshly baked, and buttered, they make an excellent after swimming treat I’ve discovered), I got the dough out, defrosted it, shaped it, left them to rise and they were perfetti. In fact I’ve done this a few times now, frozen the dough and then taken them out the night before they were needed to defrost, got up in the morning, shaped them and given them an hour or so’s rising and then cooked them and they’ve been delicious. These are life-affirmingly delicious about 20 minutes out of the oven. The Aroma Panettone is an absolute must here. These teacakes have promoted me to constantly say “there’s buns for tea” now. If there is a word in the English language more cheering than ‘buns’, I can’t think what it is. It’s so comforting, so Enid. Ironically the Railway Children was on today and they said, at least twice “we can have buns for tea”. 3 large eggs, 3 egg yolks (yikes I know, a lot of eggs!) plus one extra egg for the egg wash although I find milk works almost as well and is less wasteful, especially if you freeze the mixture and make in batches. Measure out the flour. From the 600g, take 3 tablespoons and put that in a bowl with the yeast and water. Mix it up til it’s all dissolved. Leave it for about 15/20mins, until there is obvious bubbling. Because I whisk my mixture up, be sure the bubbles you see are the yeast working (these look more like geyser bubbles) rather than just ‘whisk’ bubbles. On a hot day you’ll see this fairly quickly. My kitchen is quite cool and it can take 20 mins plus. Heat the milk up, then add the chocolate, sugar and honey. There isn’t much milk so you do think “how will the chocolate melt” but it does. If you get stuck you can always just very gently heat it up again, but I’ve never found the need. 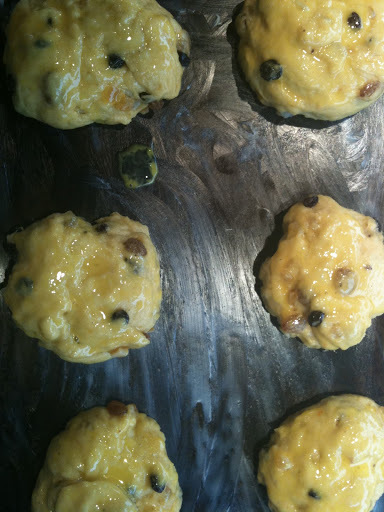 To this add the sultanas, peel, zest, salt and Aroma Panettone. Separately, whisk the eggs together – the 3 whole eggs and the 3 yolks (freeze the whites, I’ve got a killer Madeleine recipe coming soon). You’re just combining them, you don’t have to whip them into a frenzy. To these add the yeast mixture and then the milk/peel mixture. Then the flour. Use a dough hook and a food mixer if you like, or do it by hand. Just until it’s all incorporated. Leave the dough to rest for ten minutes. Then you give it a light knead, on an oiled surface, with a 30 minute rest each time. Do this three times (so to recap, after the first mixing, leave the dough for 10 mins, then light knead, rest for thirty mins, light knead, rest for 30 mins, light knead, rest for 30 mins. Now divide the dough up into a bun size. Patrick said 100g a piece, I find my buns are slightly smaller. Roll into a ball with your hand and place on a buttered baking tray (you’ll be cooking on this same tray so make sure it fits into your oven). Flatten to about 2cm thickness, or leave thicker if you prefer (they do rise up). Ideally don’t have them touching but if they do it really doesn’t matter – you just tear them apart when they’re cooked. Now leave them to double in size. This takes about 30 mins in my warming drawer. Beat the last egg and brush over the top of the teacake just as you’re ready to bake them and sprinkle over the crushed amaretti biscuits and sugar lumps. You can live without them of course but they really do add something. Patrick recommended cooking his buns for 15 mins at 220, mine can be done in half that time (our oven is practically industrial in its heat), so set a timer and check for yourself. 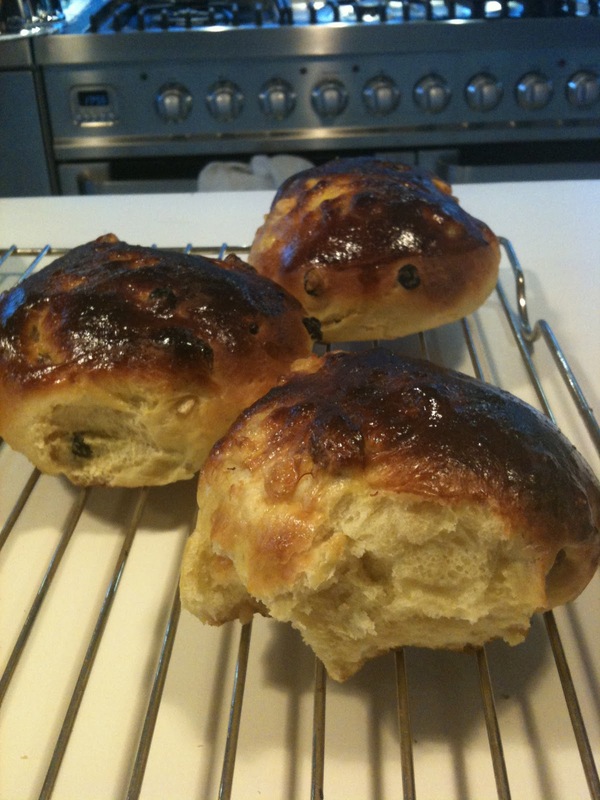 This entry was posted in Buns, Teatime and tagged buns, panettone, teacakes on April 3, 2011 by Annalisa Barbieri.